In all seriousness, I did make bread pudding a few days ago, for the very first time! Are you a fan of bread pudding? I have to admit that it isn't something that appeals to me in general. I've never really had it but my husband will order it on occasion when we're eating out. Naturally, I've been curious and bread pudding's been on my mental list of things to try one day at home. The time finally came to make it. When I baked that loaf of brioche recently, I made sure to freeze a few slices so I could have some homemade brioche for my first bread pudding endeavor. I wanted something simple so I looked up Mark Bittman's recipe, which is a basic one that doesn't involve a long soaking time or a water bath to bake the bread pudding in. I scaled down the recipe to make bread pudding for two, essentially, and I added extra flavoring in the form of fresh orange zest and a couple spoonfuls of miniature chocolate chips. Orange and chocolate is one of my very favorite combinations so I didn't think I could go wrong, and honestly, it gave this simple brioche bread pudding great flavor. I'm definitely coming to you as a novice but my husband and I think this inaugural bread pudding turned out really well; and by that, I mean it was tasty! When I was putting this together, my initial impression was that I might have too much custard. It quickly switched to a concern that I didn't have enough when the bread quickly soaked up the liquid. In the end, the bread pudding turned out soft (not wet), with creamy centers and some slightly crusty edges (thanks to a little time under the broiler). I've seen bread puddings at different ends of the spectrum - some far more broken down, rather wet in texture. We like a more intact structure but I think you can adjust according to your preference by how large you slice your bread cubes, how much custard you use, and how much mixing you do. For me, the burst of flavor from the fresh orange zest totally made the dish. And the decadent goodness from the chocolate chips would be missed if it was not there. We thought it was a winner, and I'm very glad I saved some of my brioche bread and made this bread pudding! To make this bread pudding for two, I used about 2 1/2 cups of brioche. I cut the bread into about one inch cubes. Having the homemade bread to cook with made it feel a little special. My husband will say it's the reason why the bread pudding was so good (but don't worry, I don't let his biased compliments go to my head). For the custard, I warmed 1 cup of whole milk with 2 rounded tablespoons sugar, 1/2 teaspoon vanilla extract, and just 1/2 tablespoon of butter with a pinch of salt. For the orange flavor, I added about 3/4 teaspoon of freshly grated orange zest; I wanted a strong orange flavor and I got it. Heat the mixture over the stove, then temper an egg and whisk it into the mixture to finish the custard. Pour this over the bread. Since I could not resist the call for chocolate, I went ahead and tossed in some mini chocolate cups. I only used 2 tablespoons and just a little bit goes such a long way to adding so much pleasure to the chocolate lover! Press the bread down a bit and stir it around gently to make sure all of it is coated in the custard. I had cubed and let my bread sit out for a few hours to dry out a bit more so it could better soak up the custard; I think it worked because my bread was rather thirsty! You could let the bread pudding sit for about half an hour before baking but I simply let it sit while waiting for the oven to preheat. It's all about keeping things simple and easy. My bread pudding was ready quicker than I expected. Looking for the custard to be set but still a little wobbly, I found mine done by 20 minutes time in the oven. Since the top of mine wasn't very brown, I ran it under the broiler for a few minutes to give it a little more of a golden crust in a few spots. That's mostly for aesthetics and an optional step. I wasn't convinced I'd done it correctly or how it'd taste but after letting it cool to room temperature and digging in with my husband, I was very pleasantly surprised! I call that a happy ending to another kitchen experiment. Lightly butter a baking dish that will snugly hold the bread cubes and add the bread. Place milk, butter, sugar, vanilla, orange zest, and salt into a small pan and warm over low-heat. Cook until butter and sugar have just melted. Temper the egg with a bit of the warm milk mixture, then whisk the egg into the custard. Pour custard evenly over the bread cubes. Press bread down into the custard slightly and give it a gentle stir, if necessary, to coat the bread in liquid. Let sit while you preheat the oven to 350 degrees. Bake until custard is set but still a bit wobbly when moved, approximately 20 minutes. If you'd like a bit more of a golden brown crust, set it under the broiler for a few minutes. Serve warm or at room temperature (we prefer it at room temp). Oh yum! I adore bread pudding and love the flavor combination in this version. Thank you, Amy. I'm happy I tried it. Yummy! 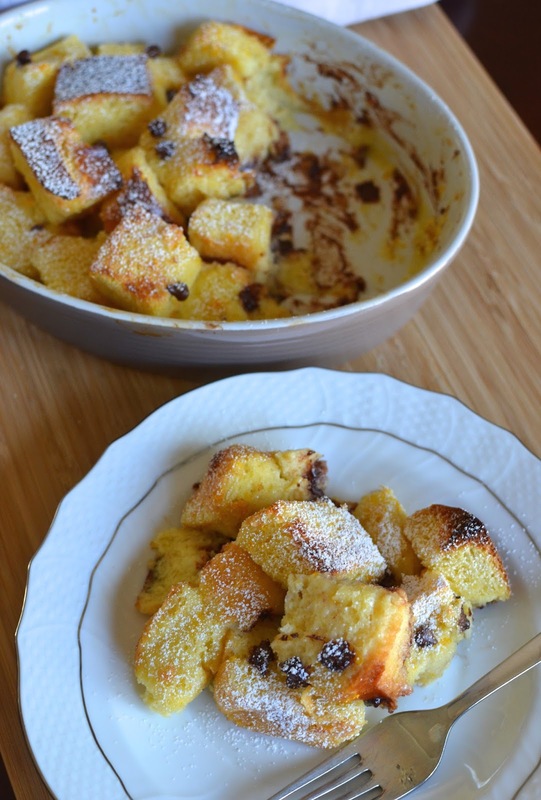 Love this easy peasy bread pudding. Love the combo of orange and chocolate chip. Droolicious. I completely agree when it comes to concerns about whether the pudding will be mushy or dry - you are so brave! This really looks and sounds wonderful. I am inspired! A little more custard would have been even better in this one, I think. I read reviews where some people added an extra egg and soaked the bread longer to make it more custardy. I was happy enough with how this first trial turned out so I can't complain. Glad to know you're a bread pudding fan! Yes, bring on the citrus! I'm always amazed by the punch of flavor a pinch or so of zest adds. Orange + chocolate is just sooo good together ... so I can imagine how tasty this bread pudding is!! I make baked french toast for holidays often (which is sorta similar!) but now I'm thinking I need to try out bread pudding! It has been ages since I last made a bread pudding. My husband loves it and he will be really happy if I make this one for him. Hi Monica, orange and chocolate go hand in hand. I'm a huge fan of bread puddings and this one looks fabulous. Take care! I personally do not care for bread pudding as I find it heavy...like your husband, my husband would order occasionally when eating out...I would just take one spoon and that's it...but the sound and the look of this bread pudding is very tempting...maybe one of this days I will try to bake one as we always have leftover bread. WOw. That looks insanely delicious! My head would explode with happiness if I ate this! Chocolate and orange is one of my favorite combinations and bread pudding is so cozy. This delicious dessert looks like perfect sweet ending to a meal. Don't you just love the crispy top and tending middle. That is the best part. I had my first try at bread pudding a few months back and I'm now in love! Orange and chocolate is such a delicious combination! Yes, I was definitely going for easy, as I generally do. : ) I very nearly made it for breakfast! Yum! It sounds like you've been having a lot of success with brioche recipes, including this bread pudding. The burst of orange and chocolate chips sound very yummy and refreshing! It's still that one loaf, to be honest. I stowed a few slices away for this and I'm glad I did. : ) I do love the orange and chocolate. I’m sucha s cuker for puddings.........! Love your recipe! Gonna give it a try soon! It's a good use of leftover bread! Thanks, Marcela. I've never had bread pudding either, but the pictures look very inviting. I think my kids would love this as well. It was a lot tastier than I expected. : ) Hope you're doing well. I'm sure it's great without the chocolate, too, but you know me, Kelly! ; ) Hope you have a great weekend, a relaxing one with a good brunch!! I'm a massive fan of bread pudding ! I will try your recipe. This would be perfect for a picnic. Monica, could you suggest me a wonderful and easy Bday cake??? It's great when you have some leftover bread...amazing what wonderful recipes/uses people have come up with for taking care of leftovers.